Row 1. Tom Brodie 2. Robert ? 3. James King 4. Tommy Orr 5. John Finnie . Front Row 1 Margt.Alexander 2. Agnes ? 3. 4. 5.Mary Sutherland . "Great site. There's so much to comment on. I lived in Greenhead St. I was in the 219th BB at the church on London Rd at the bottom of Kerr St, with the modern murals, the 155th at Bridgeton Methodist at Landressy St / James St Corner and 92nd at Bridgeton Parish Church at the corner of Dale St / Old Dalmarnock Rd. There was the 209th at Rockcliffe Parish at Rockcliffe St and the 106th at London Road St Clements. Joe Bovill, Johnny Holmes, Tom Mackie, Mr Winning. We did woodwork for our Arts and Crafts badges at the YMCA in London Rd. I'll return to this site with more. I have been working in the social work dept. since 1974, currently doing a stint in Bridgeton. I give this website address to anyone I know with a Bridgeton/Glasgow connection...its brilliant!" Feb.2003. This photo sent to me by Ronnie Stevenson, Glasgow, Scotland.
" I hope you can do something with the attachment. I'l send a donation for all the work you do on this site. Keep up the good work. This is a photo of Primary 3 or 4 at Rumford Street in 1952/53 or 1953/54. I'm on the top row Number 4. I've had a guess at some of the others I hope others have a better memory. I think I can supply some of the missing names on the 1953 photograph. Row 1 no 5 Mary Sutherland, Row 2 No 1 ? Brodie No 5 John Finnie Row 4 no 6 John Paterson AS I remember it the teacher was Miss Jacobs not Mrs Smith. Regards to Ronnie Stevenson and I would be happy to hear from anyone to remember old times. Keep up the good work. A Frank McDonald has emailed me to say he is 4th Row Number 9. I've asked him to email you. I think Top Row Number 1 is Richard Barclay. Sorry to give you more conflicting information. All the best. 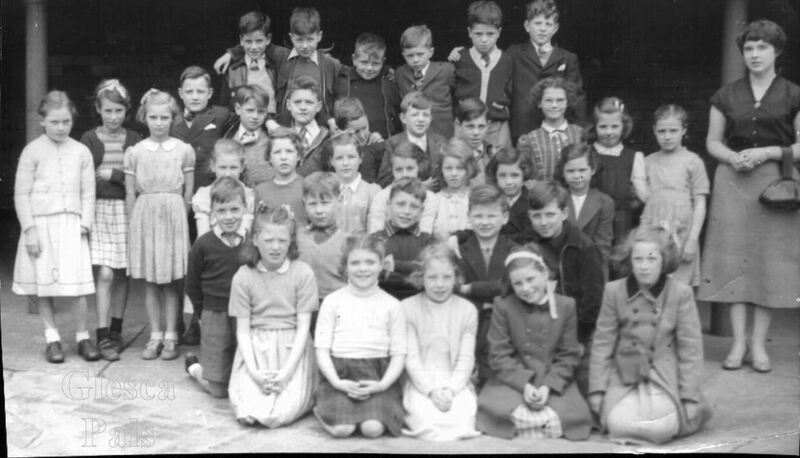 hi webmaister the boy in the photo 4th row 9 along 1953 is frank mcdonald. i ran obout with tam orr, john finnie and dacy king. i lived at 50 reid st. i knew the clarks, the royals from 60 reid st. , the farrels. john mcshane. the mcdonalds. peter an davy heinz from 70 reid st. the symingtons frm 80 reid st. and few more like the beggs rollos ralstons mckays lynns mcfadyens.i maild ronnie stevenson and put on to you wull. im just trying to get this topset together.spihope some of the info is of help. from frank mcdonald.